With the discovery of emerald ash borer in Colorado, Swingle Lawn, Tree & Landscape Care advises commercial property managers and owners to start developing an emerald ash borer management plan now as those with ash trees will be affected. Not being proactive can damage managers’ budgets in addition to the property. The scale of this event will be one of which we have never experience before. With the discovery of emerald ash borer in Colorado tree care company Swingle Lawn, Tree & Landscape Care advises commercial property managers and owners to start developing an Emerald Ash Borer management plan now, as those with ash trees will be affected. Emerald Ash Borer (EAB) is aggressive; attacking all ash trees in its way and is responsible for killing hundreds-of millions of trees in the upper mid-west and eastern states. Emerald Ash Borer was discovered in September 2013 by Boulder forestry staff according to the Colorado Department of Agriculture. The green metallic beetle is known for destroying unprotected ash trees. The larvae hatch, feed under the bark, cutting off the tree’s vital nutrients causing it to shut down. When the beetle emerges in the spring, it flies off infecting nearby trees-eventually creating a mass die off. •Consult an expert, such as a Swingle Landscape Care Consultant, to verify ash tree inventory, evaluate the trees for infestation and make custom recommendation. Research and known facts have shown Emerald Ash Borer will destroy all ash trees if left untreated. •Learn from what other commercial properties have experienced in other states: The cost of municipalities, property owners, and forest products industries nationwide is tens of million of dollars with more than 50 million ash trees destroyed. •Determine the long-term impact to a community’s budget: If community trees die, the branches will become weak and will eventually fall in severe storms or naturally over time. There are financial and safety responsibilities as a tree owner will become costly. •Emerald Ash Borer is considered the most destructive urban forest pest seen in North America. “With time all ash trees left untreated become infested with emerald ash borer and die,” say Swingle’s Plant Pathologist Steve Geist. An estimated 1.45 million trees in the Front Range are at risk. Property owners and managers need to understand the risk and cost associated with the options available. Emerald ash borer treatments work much more effectively when applied preventively. As the demand for replacement trees increases, the costs to source new trees increase. Removal costs will also escalate. Waste facilities will become overwhelmed. Ash trees killed by emerald ash borer become extremely brittle prone to breakage creating future liabilities. Specialized equipment is required to handle these structurally weakened trees. 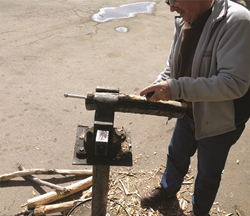 Properties can benefit now from developing an emerald ash borer management program. Spring is approaching. Evaluate your property now and plan for this long-term event. Emerald Ash Borer is here to stay; property managers there are preventative and proactive measures you can take. Doing nothing is not an advisable option. Develop a cost-effective, sustainable emerald ash borer management plan for your community’s trees. Founded in Denver in 1947, Swingle Lawn, Tree and Landscape Care has grown to be the one of the largest residential and commercial lawn service and tree care companies in Colorado, employing more certified arborists than any other Colorado company.